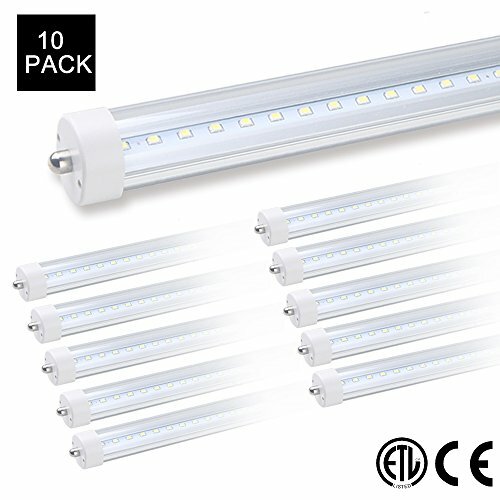 T8 LED Tube Light can be used for replacements of T8 T12 fluorescent tubes, save over 50% on electricity bill of lighting. It is widely used for workshop,supermarket, school, garage, warehouse, office, hotels, stores and other indoor places. 1. Using 1/2 aluminum pipe structure, good heat dissipating capacity. 3. Using the imported SMD as light source, high light efficiency, long life span. 4. Quick response time, the LED response time is nanosecond. 5. Environmental protection, no heavy metals and harmful gas. 6. Energy-saving, can save energy more 50% than traditional fluorescent lights. 7. High CRI, start quickly, soft light, protect your eyes. Energy Saving - 40W energy saving, replace 80W fluorescent tube, with above 4000 lumens output, Save 50% on your electricity bill. Wide Application - AC100-277V input voltage. Perfect for offices, workshops, hospitals, hotels, schools, supermarkets. Safe Assurance - The 8ft led tubes are ETL Qualified. Safe and reliable. 3 Years Warranty - Easy and fast replacement is offered if any quality issue. If you have any questions about this product by ONLYLUX, contact us by completing and submitting the form below. If you are looking for a specif part number, please include it with your message.